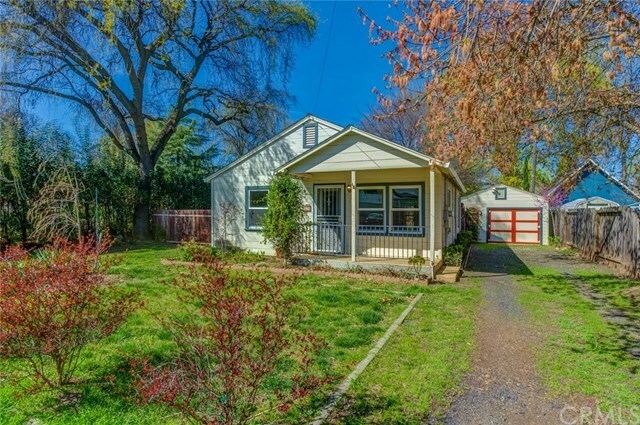 LOCATION, this cute bungalow is a short 15 minute walk to downtown Chico and Chico State. Enjoy the sunny "eat-in" kitchen with large pantry. The upgrades included in this cute house are doors, windows, carpet, interior paint, garage interior paneling and insulation, light fixtures, ceiling fans, electrical fixtures and the entire barn/studio structure is new. The barn/studio was custom built by Old Hickory Sheds, it has permits with the city and county as a storage shed. For the artist there is a sink that hooks up to an exterior hose bib of the studio. One of the best features of this home is the large private backyard, offering raised garden beds, vine trellises, bean arbor, compost bin, fruit trees and lots of shade for those warm summer days. Decorative features of the backyard, just to name a few include a canvas pergola with a decorative stone patio. With close to a 1/3 of an acre, this parcel has rich soil and many sunny areas for vegetable gardening, the owner has produced amazing tomatoes in the past! There is also plenty of room to add the pool of your dreams. Close to shopping, public transportation, restaurants and entertainment. There are so many things to love about this cute little bungalow, but to really take it all in you must see it in person.